We’re incredibly excited to announce that Hootsuite now works with Instagram! That means you can now schedule posts, publish pictures, monitor your feed, and engage with your Instagram audience right within the Hootsuite dashboard–just like the rest of your social networks. Please note that in 60 days the existing Instagram application that you downloaded from the Hootsuite App Directory will be deleted. This means that you’ll need to add your Instagram profile and set up your current Instagram streams. Once you’ve added the streams to your dashboard, you’ll have the option to delete your old streams, or they’ll be removed when the old app is deleted by September 29th. Not yet a Hootsuite user? Ask us how it can benefit your business. Written by Matt Foulger. Originally posted on HootSource. If CEOs take to social media, they can not only close the trust gap with customers, but also engage employees. A large majority of employee respondents to BRANDfog’s 2012 CEO, Social Media & Leadership Survey believe that CEOs can use social media channels to build better connections with customers (89%) and employees (85%). Their visible leadership is critical to the success of social initiatives, whether customer-facing or internal. Social media use for internal collaboration engages employees and makes them feel like true stakeholders in the brand that management would like them to promote. Therefore, any strategy for employee advocacy on external networks should take into account how the psychological conditions for advocacy are created on internal networks. Internal networks also directly support external employee messaging. For example, collaborative tools such as Yammer and Hootsuite Conversations amplify employees’ reach and impact on Facebook, Twitter, and LinkedIn. This dovetailing of internal and external social tools is accelerating the creation of the “extended enterprise”, a business with blurry organizational boundaries. Networking technologies not only bring employees closer to customers, but connect them to business contacts in the enterprise’s extended value chain, including suppliers, vendors and agencies. In this light, the distinction between business-to-consumer and business-to-business marketing starts to recede, and employee advocacy looks a lot like internal branding. Organizational permeability presents challenges and opportunities that each enterprise has to weigh as it formulates a social strategy. Written by Evan LePage. Originally posted on HootSource. Share learning internally. Encourage your Social Teams to distribute new learni ng both within the Team and your organization as a whole. Keep an ongoing loop of discovery and dissemination where best practices, positive messaging or common questions are put forward for comment or collaboration. Social platforms like Yammer and Hootsuite Conversations are exceptional tools for supporting secure internal conversation and exchange of ideas. Ultimately better internal collaboration supports improved external engagement, keeping messaging consistent, intelligent and brand-appropriate. The New York Public Library @NYPL uses Hootsuite to coordinate a decentralized team of experts. Rather than impose a centralized Social Team to respond to inquiries, @NYPL tapped into the existing, extraordinarily deep knowledge base of librarians by training and empowering them to use social. As the largest online public library in the world, @NYPL receives a very high volume of inbound requests. Using Hootsuite, the @NYPL experts are able to, through a shared dashboard, assign inquiries to the appropriate area of expertise, collaborate departmentally on a response, share and edit as necessary and schedule the response to go out at a time their audience is most likely to receive and read it. Visits to the library’s website coming from Twitter increased more than 350 percent in one year. In social media, there is nothing more powerful than someone advocating for your brand. Advocates give their friends, families and colleagues trusted advice that is far more credible than any source of advertising. They defend a business against negative messaging in the countless small interactions that determine a brand’s health. They volunteer ideas for product and service improvements. And they do it all for free. It’s no wonder, then, that just about everyone is looking for advocates. Companies are executing deliberate social media programs to find, activate and maintain these vital assets. Understandably, current engagement efforts are focused on making evangelists out of customers, widely considered the most authentic and valuable spokespeople. Influencers in the news media, academia and other fields are also cultivated. But while enterprises reach out to these external constituents, the best potential advocates hide in plain sight — their own employees. While not without its challenges, widespread employee advocacy is the surest, cheapest way to scale up a company’s social media reach. Instead of achieving linear growth in customer advocacy through incremental investments in social media teams, an enterprise can magnify its reach at very little cost by activating a broad cross-section of its existing workforce. The following illustration compares the maximum achievable social audience of an average Fortune Global 100 company to the maximum achievable social audience of its employees. 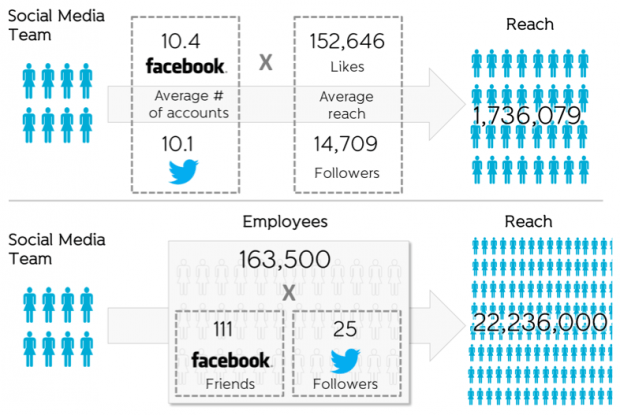 The aggregate figures do not represent “unique” followers because corporate accounts have overlapping audiences, and employees have a number of social contacts in common with other employees. But in the case of employees, this overlap, or “network density”, is less significant than common sense might suggest.Pew Internet found that on Facebook, “people’s friends lists are only modestly interconnected”, with a network density “low in comparison to studies of people’s overall personal networks”. Your employees’ Facebook networks aren’t echo chambers, but viral gateways. Each employee can be the first link in a long chain of intimate, person-to-person shares. By increasing the number of starting points for social sharing, a company greatly improves its chances of viral marketing success. Although many advertisers have sought the support of highly-connected “influentials” to initiate viral marketing campaigns, research indicates that the most likely path to virality is a “big seed” strategy. In this approach, viral ideas are seeded by a large selection of first-generation sharers, instead of a relative handful of highly- connected people. A Certified Hootsuite Solution Provider Share. While each brand will have it’s own communication style, there is a right way and a wrong. The most important thing you can do is to acknowledge the voice of the customer, really hear and respect what they are saying. If what you’re hearing is a complaint, let them know a resolution is being sought, then follow through on that resolution to the best of your organization’s ability. Once again, don’t consider social in a vacuum. Integrate your response with existing channels and let the most appropriate channel lead the way to resolution. Listen and pick your moments. If sales are a priority, nurture potential leads with relevant and helpful content. Make sales through engagement. The age- old sales maxim, “Make a friend first, a sale second” still applies to social, only even more so due to social’s ability to amplify positive, or negative, experiences. Give advice. Hilton Hotels takes an entirely non-sales oriented approach with @HiltonSuggests by taking an engagement for engagement’s sake position. Hilton monitors online conversation for travelers looking for recommendations all over the world. Acting as a quasi global concierge, @HiltonSuggests steps in to offer accommodation advice to travelers whether a Hilton is a viable option or not. 61 percent of consumers use social to look for discounts. Social is obviously a great way to highlight promotions and deals, but make them appropriate and relevant to your brand. For example, why would a bakery give away an iPad? Promotions of this kind are common and can build vanity metrics such as Likes or Follows, but those need to be balanced with engagement. How engaged are iPad fans with bakeries? Fans of customized cakes are much more likely to be highly engaged and even influential to a fledgling bakery. Fewer more influential followers trump hordes of deal hunters every time. With Hootsuite’s custom URL parameters, our bakery could even track conversions arising directly from their posts to Twitter, Facebook or LinkedIn and put that iPad to use around the office.